Two of Springfield's finest -- peace officers with the Springfield Police Department. 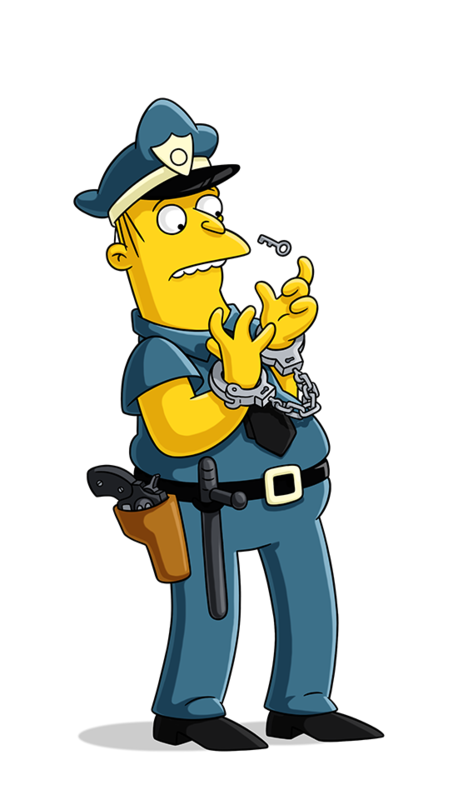 Their boss is Police Chief Wiggum. The duo have mastered cornering the patrol car in a high-speed pursuit without spilling a drop of coffee. They developed their own special test to determine if a driver is drunk. It involves hopping from one foot to the other while touching your nose with alternating hands and singing "I'm a Little Teapot, Short and Stout." Homer has to choose between a long healthy life with his family or a short life of delicious junkfood with the Big is Beautiful group. Springfielders think there's something going on between Marge and Dwight. The police intervene with the protestors who are chained to trees. Homer beats up Barney so Barney doesn't drive durnk, and fails a sobriety test. Bart discovers that Sideshow Bob is responsible for Krusty's arrest. Bart tries to raise money by selling lemonade and beer. Homer plays the bass and causes Marge grief. How do you figure we missed that? Say, uh, you got a liquor license there, young fella?